Get the latest information on the mailing and shipping industry. USPS Priority Mail is an expedited service that provides delivery anywhere in the U.S. within two to three days. With a maximum allowable package weight for this mail class is 70 pounds, priority mail is an affordable solution for a wide range of packages. Priority Mail rates have increased an average of 5.9 percent in 2019. A one-pound package traveling from Los Angeles to New York (Zone 8) costs $8.25 in 2019, up from $7.76 in 2018. Though there is an overall rate increase in 2019, many packages will actually be cheaper to send in 2019 than they were in 2018. 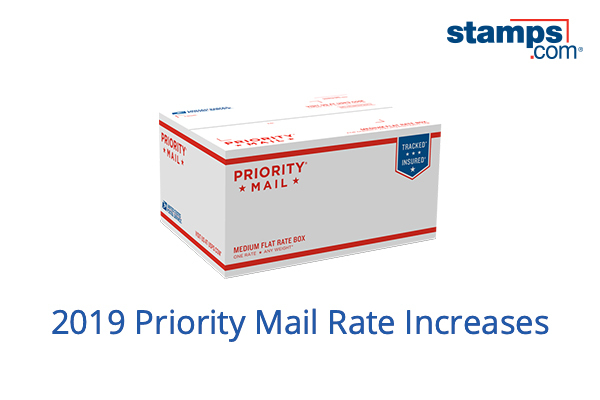 Rates for Priority Mail Flat Rate Boxes and Flat Rate Envelopes also increase in 2019. A Priority Mail Padded Flat Rate Envelope will cost $7.55 in 2019, up from $7.10 in 2018. Priority Mail Regional Rate Boxes provide great cost savings over regular Priority Mail when your parcel is over two pounds. For example, a Priority Mail Regional Rate Box A that weights five pounds for delivery to Zone 8 will cost $10.80 in 2018 compared to $21.03 for regular Priority Mail. Are USPS Services being removed from Stamps.com? Absolutely not! Nothing changes in Stamps.com services and features that we offer, including USPS postage printing. Stamps.com will continue to operate as an officially licensed PC Postage vendor, and all USPS services will be available for our customers. Will Stamps.com continue to offer USPS rate discounts? Yes! Stamps.com customers will be able to access all existing USPS rate discounts (Commercial Base Pricing) when they print postage. And those discounts include access to the Metered Mail rate for First Class Mail letters – paying only $0.50 for a one-ounce letter vs. $0.55 at the Post Office. Priority Mail Express® – Save up to 14% off Post Office rates on all Priority Mail Express shipments. Priority Mail® – Save up to 40% off Post Office rates on all Priority Mail shipments, depending on weight and distance. First Class Package Service – Save up to 28% off Post Office rates on all First Class Parcels. International Shipping – Save up to 5% on Priority Mail International shipments, up to 5% for Priority Mail Express International and up to 5% on First Class Package International Service. First Class Mail Letter – Save five cents and pay only $0.50 for a one-ounce First Class Mail letter compared to $0.55 at the Post Office. Can I still print labels for USPS First Class Package Service with Stamps.com? Yes! Nothing is changing to the Stamps.com service and USPS First Class Package Service will remain the best low cost shipping option for packages under 15.999 ounces among all shipping carriers. Are any of the e-commerce integrations with marketplaces (eBay, Amazon, etc.) or shopping cart integrations (Shopify, BigCommerce, Magento, etc.) going away from Stamps.com? Nothing is changing – e-commerce sellers and online retailers will continue to be able to import their orders directly into Stamps.com to print USPS shipping labels. See a full list of Stamps.com E-commerce Integrations. Will there be any additional costs to use Stamps.com? Most customers will see no change in costs to use Stamps.com. For a limited group of high volume customers that have specialized negotiated rates with the USPS (also known as Negotiated Service Agreements or “NSA”), we will look at implementing surcharges as needed so that we are compensated for the technology and services we provide. How does Stamps.com’s relationship with the USPS impact me as a customer? For most customers, there will be no change to the Stamps.com product – the solution will continue to print USPS postage as it always has. In the future, you may see additional shipping carriers as an option to print shipping labels. Will the Stamps.com shipping API change? The Stamps.com API is the #1 USPS postage API in the industry. Customers will continue to be able to rate, ship, print and track USPS packages from our SOAP based web services API. Get more info on our USPS Shipping API program. Since its introduction in 2014, Metered Mail rates have offered businesses of all sizes a way to save using Online Postage. Metered Mail rates apply to First-Class Mail® Letter postage printed through USPS licensed software (such as Stamps.com) or using a postage meter. Online Postage costs the USPS significantly less than traditional postage stamps, and the savings are passed on to customers through Metered Mail rates. Metered Mail Savings Are Bigger Than Ever – Save 5 Cents on Every Letter! With the recent 2019 USPS Postage Rate changes that started on January 27, 2019, single-piece letter senders can save even more using Meter Mail as opposed to retail (or Post Office) rates. The Metered Mail rate for one-ounce First-Class Mail® Letters has increased from $0.47 to $0.50, while the retail rate has increased from $0.50 to $0.55. These new rates mean businesses save $0.05, or nine percent, on one-ounce First-Class Mail® Letters when using Online Postage. 2019 marks the first time ever that the Metered Mail savings have exceeded $0.03. For businesses looking to reduce postage cost, there has never been a better time to switch to Online Postage. In addition to the changes to the base price of First Class Mail, the rate of each additional ounce has also changed. Whether you purchase First Class postage at the post office or with at the Metered Mail rate you will pay $0.15 per additional ounce, a $0.06 decrease from 2018. The new additional ounce rate means that while 1 oz. rate for First Class Mail has increased since last year, the 2 oz. and 3 oz. rates have decreased. Stamps.com customers automatically receive the new discounted Metered Mail rate. When printing Online Postage for First-Class Mail® Letters, customers can select the Metered Mail rate or manually enter a stamp amount. In addition to Metered Mail, Stamps.com has also been updated with every USPS Postage Rate for 2019. At Stamps.com we often receive questions about the annual USPS postage rate increase. To help clarify some of the questions we get most, we’ve compiled this FAQ. When did the new USPS rates start? The 2019 USPS postage rate increase went into effect on Sunday, January 27, 2019. When printing postage online for letters, do I get a discounted rate? Yes, customers who print postage using Stamps.com save 5 cents per letter, paying only $0.50 instead of $0.55 (Post Office rate) – a 9% savings! This discount is known as the “Metered Mail rate” and is available for all postage printed using an approved PC Postage/online postage vendor such as Stamps.com. I printed $0.47 “Metered Mail rate” NetStamps with Stamps.com in 2018. Can I use those NetStamps in 2019? Since the “Metered Mail” rate is now $0.50 to send a one-ounce First-Class Mail letter, you will need to add additional postage worth $0.03 to your letter. When printing shipping labels online, do I get a discounted rate? Yes, customers who print postage online automatically qualify for discounted shipping rates (known as Commercial Base pricing) when purchasing Priority Mail, Priority Mail Express or First Class Package Service. These rates are automatically calculated when you print a shipping label inside the Stamps.com platform. Does Stamps.com have an option to ship Merchandise using First Class Mail International Large Envelopes/Flats? Yes! Stamps.com provides an exclusive service for online retailers to ship merchandise in a Large Envelope/Flat to an International destination at a significant cost savings compared to First Class Package International Service/ The savings can be $10.00 or higher per Flat shipped! Is the Dimensional (DIM) Weight divisor changing for the USPS? Note: The USPS has postponed this change until June 2019! The Dimensional Weight (DIM) divisor for Priority Mail packages over 1 cubic foot (1,728 cubic inches) is being adjusted from 194 to 166. DIM pricing is also being added to all shipping zones for Priority Mail parcels over 1 cubic foot as well as to Parcel Select and Priority Mail Express. Did First Class Package Service rates change in 2019? Yes, First Class Package Service is moving from a weight-only pricing to a zone and weight-based pricing. Rates will be based on the weight of the package (in ounces) and the shipping zone the package is traveling to. I am a Stamps.com customer. Do I need to take any actions to get the new rates after January 27, 2019? No, if you are a Stamps.com customer, you do not need to take any action. Stamps.com automatically updated all USPS rates inside the software and web-based version (Stamps.com Online) on Sunday, January 27, 2019. As of January 27th, 2019 USPS First Class Package Service follows zone-based pricing. Shipping rates for packages are now based on the distance your package will be traveling. Using the zip code of the packages origin and the destination zip code along with the weight of your package, the USPS calculates a zone-based rate. To determine the zone of your package visit the USPS Domestic Zone Chart. Stamps.com customers can automatically see the zone-based rate when shipping with First Class Package Service.